Off we go…on another adventure! 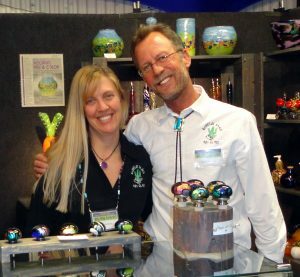 We sell our hand blown glass at juried art festivals because we really like the travel to new and interesting locations throughout the Southwest and the many adventures we have along the way. In addition, there is something special about meeting our customers in person and selling our artwork directly. Those customers who purchase our glass art can better appreciate the hard work we put into every piece we create. We can explain how it is made and connect with our glass collector. What we enjoy the most about selling our work on the road is the social interaction with all the other artists who participate in the same events that we do. Its like a traveling family of creative souls and over the years we have met some very special people. No shows this month…we are busy blowing glass.